When the folks at PB Crave asked if we wanted to taste test some of their creative flavor mixtures, we were all in! PB Crave offers four unique peanut butter blends, including, peanut butter and banana (CoCo Bananas), peanut butter and raspberry (Razzle Dazzle), peanut butter and cookie dough (Cookie Nookie), and peanut butter and chocolate (Choco Choco). There's a special place in our hearts (or should we say stomachs?) for peanut butter. We may or may not have two jars of natural crunchy peanut butter in the drawer at work right now (and a few at home). So, when the folks at PB Crave asked if we wanted to taste test some of their creative flavor mixtures, we were all in! 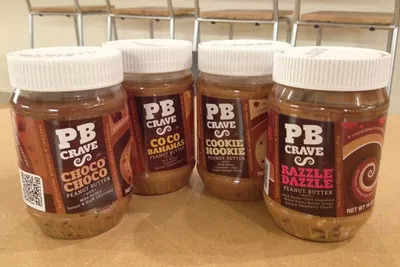 PB Crave offers four unique peanut butter blends, including, peanut butter and banana (CoCo Bananas), peanut butter and raspberry (Razzle Dazzle), peanut butter and cookie dough (Cookie Nookie), and peanut butter and chocolate (Choco Choco). We grabbed fresh baguettes, spread on the flavors, and ended up with a tie: Choco Choco and CoCo Bananas. Peanut butter and banana is a classic combo, and the peanut butter and chocolate mix was also a winner. Neither was too sweet, which we liked! On the other hand, the Razzle Dazzle and Cookie Nookie were a little too sugary, but they could be a satisfying pick if you have a sweet tooth. Choco Choco: 6 grams of protein, 14 grams of fat, and 180 calories. CoCo Bananas: 7 grams of protein, 15 grams of fat, and 180 calories. Razzle Dazzle: 6 grams of protein, 14 grams of fat, and 180 calories. Cookie Nookie: 6 grams of protein, 15 grams of fat, and 180 calories. In comparison, 2 Tbsp of regular Jif peanut butter contains 7 grams of protein, 16 grams of fat, and 190 calories. Part of PB Crave's mission is to give back to the community. Proceeds from every jar of PB Crave peanut butter goes directly to Project Peanut Butter, a non-profit organization focused on treating malnourished children. Nice!